French cyberpunk / dark-wave project Fixions are, they say, influenced by ‘classic movies such as Blade Runner, Akira, Ghost in the Shell, the extreme metal scene from the 90s, Amiga video games, Fixions evolves in a style mixing dark and surrealistic elements, bombastic, powerful production, and a solid 80/90s dystopic science-fiction aura.’ With this, their fourth album, they threaten ‘the most extreme and deep release they ever produced’ in the form of ‘a concept album inspired by classic cyberpunk fiction tales, where every track depicts one of the thousand dangers the “Edgerunners” will encounter when visiting the city at night [and] sees Fixions merging futuristic urban ambiances with dark epic elements and heavy, abrasive sounds’. 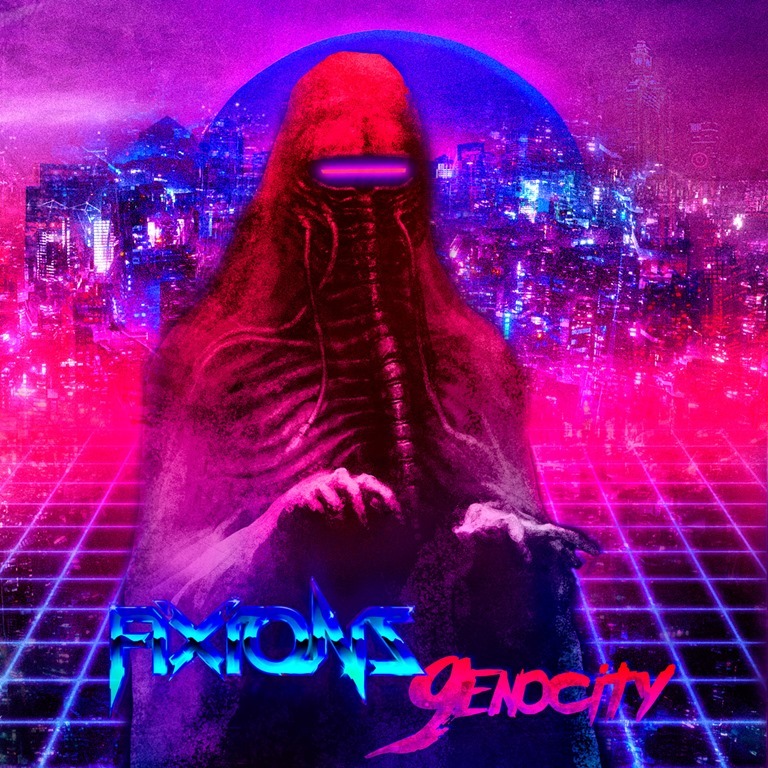 While the concept might not be rendered entirely explicit through the album’s 16 instrumental tracks, but themes emerge both from the audio content and the titles (not to mention the cover art) applied to the compositions: ‘Crimeware’; ‘Terrorwave’; ‘Black Chrome Riot’ all contrive to summarise the intent of Genocity, which to all intents and purposes does come across as a sort of reimagining of Neuromancer in audio form. Jittery, skittery, interloping lead lines weave their way over thumping basslines that wow and drag, melded to stomping, insistent, industrial-strength disco beats. It’s all about the imposing soundscapes and minor chords, the tension and the relentlessly restive digital flittering. There are grooves aplenty – hard, driving eurodisco grooves packed back to back, interspersed with more contemplative Kraftwerk-inspired tracks. Does it sound futuristic? Not really. The ‘80/90s dystopic science-fiction aura’ is all-encompassing. The sonic elements are all tried and tested, well-worn tropes which evoke the spirit of ‘the future’ as it looked in those line-green neon-hued imaginings from the 1980s. As such, it’s possible – and indeed hard to resist – viewing Genocity as a sort of nostalgia piece, in which the time and space being yearned for is a golden age in which the future – a future which ultimately failed to become the reality in the present in which we now find ourselves – offered exciting and near-infinite potentials. Perhaps the realisation of that failure is the thread which ties the fictional technological dystopias of the 80s and 90s to the bleak cyberreality of the Internet and the digital age as we now experience it. At least the dystopian digital futures depicted in fiction were, and are, just that – fiction. Artificial Intelligence and automation, a reality in which everyone carries a computer which pinpoints their precise location 24/7 have not given us more leisure time, or more freedom, but has instead overtaken and occupied every inch of everyone’s lives and resulted in the erosion of freedoms at a pace which perhaps even outstrips the technological advances themselves. When faced with incalculable progress and its effects on the psyche, it’s only natural to regress to safe times. There is, beneath the tension and amidst the dark currents which flow through Genocity, a certain sense of a regressive channelling. And so while it may not be the sound of the future, it does provide a perfectly serviceable recreation of futures past.